The Honorable Regina Bartholomew, a native of New Orleans, and a graduate of a New Orleans Public School, obtained her Bachelor of Arts Degree in English, with a minor in Political Science from Southern University at New Orleans in 1994. Judge Bartholomew earned her Juris Doctorate degree from Loyola University School of Law in 1999, where she ranked in the top 20% of her graduating class. She was admitted to the Louisiana State Bar in 1999. While in law school, she was inducted into the National Order of Barristers and was featured in Who’s Who Among Students in American Law Schools. She also received several awards and recognitions, including an Excellence Award for her participation in working as a student District Attorney with the Clinical Education Program, the American College of Trial Lawyers’ Medal for Excellence in Advocacy, the Hannah and Herman Levy Scholarship of the Lupin Foundation, and the Association of Trial Lawyers’ J. Skelly Wright Chapter Award. Upon finishing law school, she completed a judicial clerkship with Judges Becnel, Jasmine and Snowdy at the Fortieth Judicial District Court, as well as with the Louisiana Fifth Circuit State Court of Appeals. Judge Bartholomew currently serves as Judge for Division B of the Civil District Court for the Parish of Orleans. Prior to her judgeship, she served as Of Counsel with the law firm of Boykin, Ehret & Utley, APLC. Her prior employment was as General Counsel for Charlotte-Mecklenburg Schools in Charlotte, North Carolina. Prior to this, she was a Staff Attorney with McGlinchey Stafford, PLLC. Her previous work experience includes service as General Counsel for the Orleans Parish School Board, an attorney in private practice with several law firms, and with the United States Government at the U.S. Department of Labor, Office of the Solicitor in Dallas, Texas. In addition to the practice of law, Judge Bartholomew has devoted her life to many civic and bar association activities. Specifically, she is a member of the American, National and New Orleans Bar Associations. In addition, she is a former board member of the Early Childhood & Family Learning Foundation; she is a member of the National Association of Women Judges, the A.P. Tureaud Chapter of the American Inns of Court, the Louisiana Association of Black Women Attorneys, and the Louis A. Martinet Legal Society. She is also a member of the Urban League of Greater New Orleans, the SUNO Alumni Association, the League of Women Voters of New Orleans, and the Greater New Orleans Coalition of 100 Black Women. She is a former member of the Lawyer Referral and Information Service Committee and the Practice Assistance and Improvement Committee of the Louisiana State Bar Association. Judge Bartholomew has also served as a board member of the Boys and Girls Clubs of Southeast Louisiana, AIDSLaw of Louisiana, Inc., and a board member and secretary of the Louis A. Martinet Legal Foundation and Camp Fire USA Greater New Orleans Council. 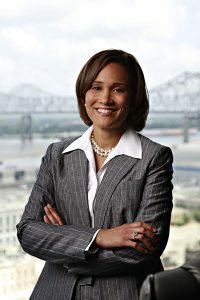 Further, she served as co-chair of the Louis A. Martinet Legal Foundation’s Law Camp and the CLE Programs Committee of the Young Lawyers’ Section of the New Orleans Bar Association. Moreover, she has served as a liaison for the Pro Bono Project of New Orleans and as a Judge for Teen Court of New Orleans. Most recently, Judge Bartholomew was inducted into the New Orleans CityBusiness’ 2011 Leadership in Law Class. Her proudest accomplishment is serving as mother to her three sons, David, Reginald and Jimmie.